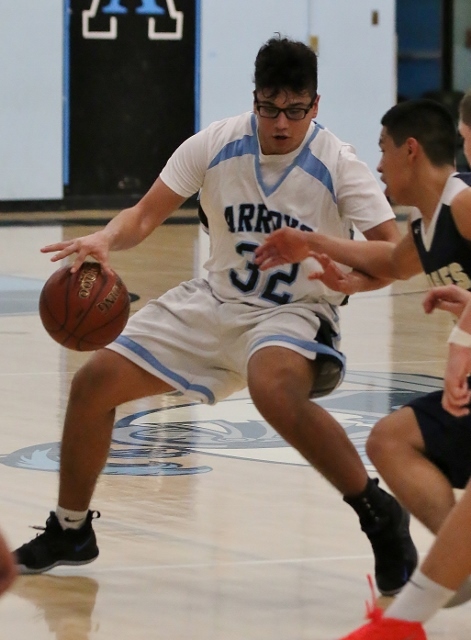 (El Monte) – Arroyo went on a 15-4 run to open the third quarter and went on to beat South El Monte 62-44 Wednesday night at Vern Nelson Fieldhouse. The Knights led by just two at the half before breaking it open to 13 in the third and never looked back. South cut the lead to six at 37-31 at the end of three but the Knights had a big fourth quarter outscoring South 25-13 to put it away. Neither team could find a groove early in what was a ragged first half. The Knights led 14-10 after one but there were only 14 points scored in the second quarter combined as the Eagles won the quarter 8-6 to trail 20-18 at the break. Anthony Ruiz led the way for Arroyo with 19 points including five three point bombs. Ruiz buried three treys in the fourth quarter and had 11 in the final period overall to bury the Eagles. Ruiz also got the Knights started with eight points in the first. John Fayad had 16 for Arroyo- all of them coming in the second half. He helped spark the third quarter surge with 11 points. Joseph Sanchez scored 13 points and Anthony Ramirez added eight. For South El Monte, AJ Carreon topped the scoring column with 21 points with most of his damage coming down in the paint. Carreon had nine in the fourth quarter as he tried to keep South in the game. Josue Ramirez had 11 (7 in the first quarter) and Joshua Medina added six. With the victory Arroyo moved into sole possession of first place in the Mission Valley League with a 7-1 record. The Knights are 11-7 overall. 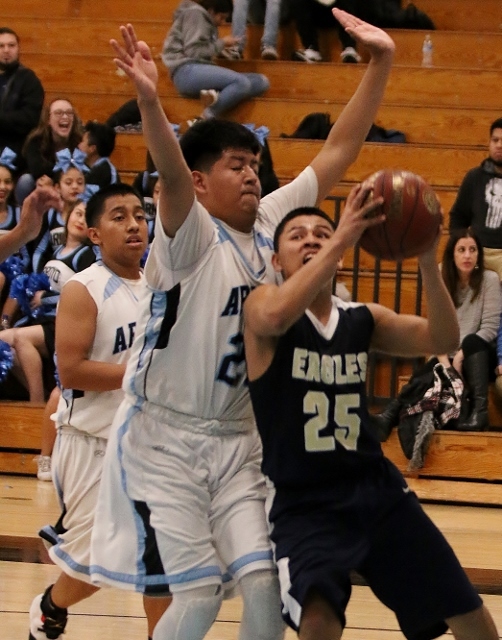 South El Monte fell a game back of Arroyo at 6-2 and fell to 14-8 on the season. 2 Comments to "Knights On Top in MVL"
He went from Monrovia to South to Monrovia to South, apparently the football coaches at South are so bad that he just kept leaving for football and coming back. Not sure why he chose Monrovia when there are plenty of schools closer he could of attended and had more success. I thought AJ Carreon played football at Monrovia this year. How can a kids play football his junior year a South El Monte than play football his senior year at Monrovia than play basketball his senior year at South El Monte? Something is wrong with the system.